I did not have Eleanor Oliphant Is Completely Fine by Gail Honeyman on my summer reading list, but I’ve heard good things about it all summer, and I saw it at the bookstore over vacation and bought it on impulse. It was supposed to be funny and quirky and I thought it would make a good summer read. 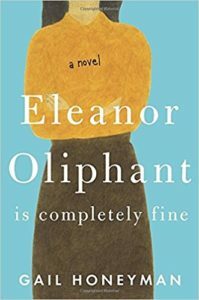 Eleanor Oliphant Is Completely Fine is about Eleanor, a woman in her 30s in England with a difficult past. She leads a completely solitary life, spending from Friday to Monday in an alcohol-induced numbness to pass the days until she gets back to her unsatisfying job as an accountant. When the book opens, two things happen that shake Eleanor out of her strict routine. First, she goes to a show to hear a band (only because it was a work obligation), and falls in love with the lead singer, a man who is wildly inappropriate for her. And she meets the IT guy at her office when her computer stops working, and they end up becoming friends. These two developments bring about two competing changes in Eleanor’s life. The friendship with the IT guy – her first real friendship, ever – gives Eleanor a glimpse of what a normal life is like, one in which she has worth and receives kindness, something she never got from her mother. But the crush on the singer, destined to fail from the start, sends her into a tailspin that threatens to undermine the parallel positive developments in her life. Eleanor Oliphant Is Completely Fine is not a light, quirky book, as I suspected. It is a much darker, more serious read about the impact of deep, emotional abuse. Eleanor is difficult and thorny and unable to relate to people, but it’s not her fault. As Honeyman unpeels the layers of Eleanor’s mind, you start to appreciate just how traumatized she is. There is progress and positivity, but it’s a difficult road to get there. Thankfully, there is also a lot of humor in the book to help ease the way. Eleanor Oliphant Is Completely Fine is one of those books that I find myself flashing back to often, which to me is always the sign of a good book. I am glad I gave in to the impulse at the bookstore. Posted on August 10, 2017 by gayle. This entry was posted in Fiction and tagged eleanor oliphant is completely fine, gail honeyman. Bookmark the permalink. I have this on audio and have been debating on whether to listen to it or not. I’m glad you liked it. Like you, this was not on my TBR, but you’ve got me thinking I need to add it. I like humor (especially these days) but I also respond to multi-layered characters. Thanks for the review!